A lot of people have been asking me to take a look at Cardinals prospect Jaime Garcia. I DVRed the game today and am looking for some high speed film of his mechanics. 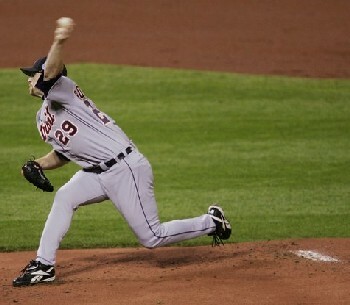 In the meantime, here are a couple of interesting pictures I have found of him pitching. The photo above is a picture of Jaime Garcia at the release point (of what looks like a fastball). Notice all of the shoulder tilt and the fairly high arm slot as a result. One thing I like in this photo is the glove around the glove side pec, rather than flying out to the side like Rich Harden (see below). What I don't like is how the Glove Side (GS) knee is locked, because this can lead to at least knee and hip and possibly arm problems by increasing the shock on the system. I also don't like how Jaime Garcia leaves his Pitching Arm Side (PAS) foot behind on the rubber, because this can stop a pitcher's hip/shoulder separation short. What I prefer to see at the release point is what Nate Robertson is doing in the photo above. Notice how he still has some flex in his GS knee and his PAS foot is well off the rubber and his PAS knee is bent roughly 90 degrees. 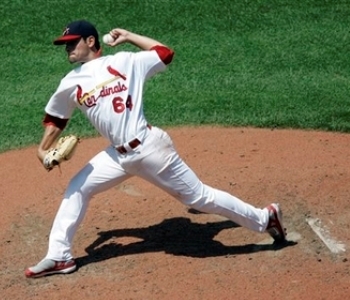 Above is a second photo of Jaime Garcia that is a bit awkward-looking, and worrisome as a result. While Jaime Garcia is showing tremendous, Lincecum-esque hip/shoulder separation in this photo, he also seems to be leaning back toward Third Base quite a bit in this photo. While he has to do this because of his high arm slot, I am worried about the strain it puts on the lower back. It's one thing to rotate the torso and spine 90 degrees as Tim Lincecum does. As Chad Bradford showed with his lower back problems, it's something else -- and something probably worse -- to rotate the torso and spine 90 degrees while also leaning forward or back. I am worried about Mark Worrell's lower back for the same reason. 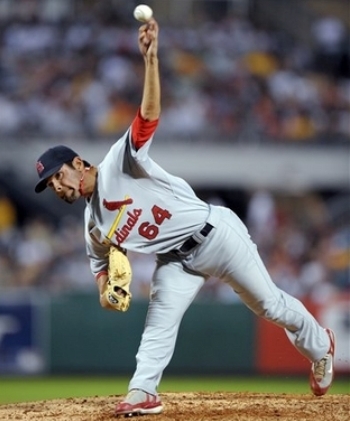 Not to be a total downer, I do like the non-90-degree angle of Jaime Garcia's PAS elbow in the photo above. I wrote all of the above before I had seen any video of Jaime Garcia. While I didn't find any high speed video of Jaime Garcia's pitching mechanics, I did manage to extract some high-resolution, 60 Frame Per Second video. I'm not thrilled with what I see. As I said above, the photo above of Jaime Garcia is quite unusual. While he's showing good hip/shoulder separation, his body position is a bit off. If you look at the video below, you will see that his body position in this photo is the least of his problems. The problem is that Jaime Garcia breaks his hands with his elbows (see Frame 38). While he doesn't get to the classic Inverted W or Inverted L positions, he still develops a timing problem as a result. The thing to notice is how in Frame 45, as his GS foot plants and his shoulders start to rotate, Jaime Garcia's PAS forearm is at least 45 degrees short of vertical. As a result, in Frame 46 and Frame 47, and especially in Frame 48, Jaime Garcia's PAS upper arm is in a very odd position, as if it's dragging behind his body (and showing some signs of hyperabduction). It hurts my shoulder just to look at Frame 48. Jaime Garcia is not the answer to my Cardinals' prayers.